A wooden honour roll commemorates those from the band who served in World War One. 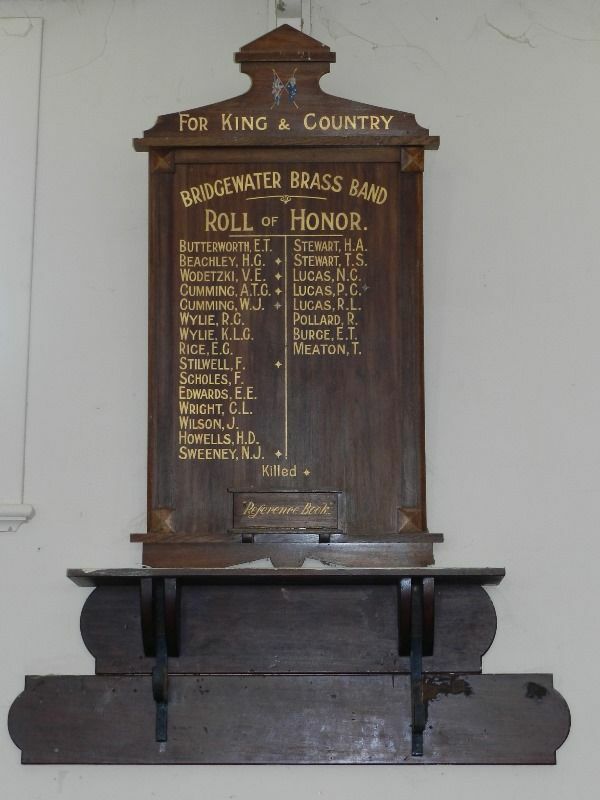 The unveiling of the Bridgewater Band Roll of Honor took place on Wednesday night at the Mechanics Hall. There was a large attendance, Mr C. Burge occupied the chair. The chairman, in his opening remarks, said they were there to honor the 23 old players of the band who had enlisted and were now in France fighting for the honor of the Empire; except two who had returned. Mr J. Scholes, who unveiled the honor roll, referred to the quality and determination of the men who had gone. On unveiling the honor roll, the audience rose and bowed their heads in honor of the heroes, as some of those lads whose names were on the board would never return. The Bendigo Independent (VIC), 14 July 1917.